What a whirlwind week for top-notch Destiny news! While House of Wolves content is pouring in and raising our hopes and dreams to a fever-pitch, we’ve got some fascinating items from around the world of Destiny fandom as well. With Bungie listening so closely to fan requests, did you know they’ve been trying to speak our language all along? Quite literally, as we’ve got a story of the localization nightmare that was Destiny and how Bungie tackled it. And have you ever wanted Xur’s exotic weapon so bad you spent hours grinding for Strange Coins… in a taco shop?! One player that did – and so much more – in our latest Stranger than Fiction. Click here to read other interesting stories in past STF articles, and be sure to check out our Community Spotlight videos as well. A dedicated Destiny player by the name of “LAN Fiesta” just wanted to feel like Clint Eastwood. So when he saw The Last Word with its fanning bullets in Xur’s stock, he did the only logical thing someone could do: Ranked up a Titan to level 25 in one day and farmed for Strange Coin like crazy. Sounds like a typical Saturday, right? It would have been, except for one minor detail… the power in his house went out. In an instant, just one Coin away from the hand cannon he’d salivated over for hours, LAN Fiesta probably felt his heart fall into his stomach. But Destiny players persevere; we know the struggle all too well and we don’t give up. So what did LAN Fiesta do? 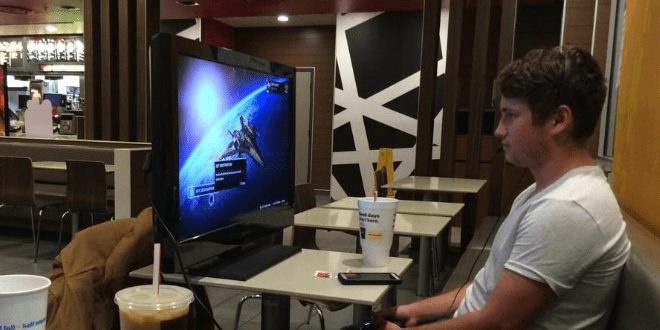 He braved the storm outside, a television in one hand, his Xbox in the other, and Polygon reports he went to the only logical place: McDonalds. That is, he went to McDonalds until something scandalous & horrifying happened. McDonalds closed. That’s right, it gave LAN Fiesta the proverbial boot, and so he lugged his gear to Taco Bueno, where he set up everything for the second time, praying for just one more coin. The two ladies manning the Taco Bueno stayed after hours, cleaning up around LAN Fiesta, and even provided him with a free nacho plate. And just when he thought he would go home in shame, with about 7 strikes under his belt, a miracle happened. That final Strange Coin dropped like a gleaming beacon of hope. Guardians, rest soundly knowing the struggle is real, and you’re not alone. What’s the only thing more frustrating than being an English speaker in a foreign country trying to pantomime directions to a taxi driver? Being the taxi driver. Language is a hot-bed of division, and Bungie discovered that the hard way. In a Game Developers Conference (GDC) talk, Bungie walked other developers through the lesson they learned, and you’ll be surprised to know it completely changed the Tower we know and love. You see, Bungie thought the best way to communicate with players was in their own language, so they put English all over the signage throughout the Tower. Want to know where the bounties were? Look for the big word “BOUNTIES” written on the floor. Want to know where the Cryptarch was? Look for the big word, “USELESS”… oh wait. But Destiny is translated into 7 languages, so every bit of English means six other bits of other languages, and the developers found those signs began to be muddled lists that made things more confusing than helpful. So they did something largely unheard of in video games, and created a localization team in-house. No more outsourcing, no more pass-the-baton translation jobs. What did it mean for the Tower? Well, if you haven’t noticed, text is almost non-existent. Bungie opted for symbols over text, so if you see the little bullet over the Gunsmith, now you know why. And it also meant that players from different countries no longer felt like that foreigner walking in a strange land. What we’ve got now is an international Tower where players from all over the world intermingle without so much as a confused glance. Well, except for all that Latin on the floor, which Tom Slattery said, “Looks cool” and “nobody knows what it says” anyway. Do you find the Bungie app for your phone a little clunky when transferring vault gear and items? You’re definitely not alone, which is why dasilva333 has created an app would should all kiss his feet for. Now you can filter by name, gun progress, burn type, weapon tier (exotic, legendary, etc.) and more. It’s like a tiny marvel of convenience in your pocket, and you can find it all here along with a plethora of other features and screenshots. This tool is available on nearly every platform as well, so whether you’re using a Windows Phone or Firefox browser, it just works. If you’ve ever dropped into a firefight without your gear and then made friends wait for five minutes while you transfer that Gjallarhorn, no more excuses. Do you remember Derek Lopes, the Destiny player with cerebral palsy who beat Crota with his feet and thumbs? Well, he’s got another video up of him soloing the bridge portion of Crota’s End, and it’s pretty spectacular viewing. So check out Brian McDonough’s YouTube channel here for that and any other runs you might have missed! To cap the week off, we’ve got two videos that show community members doing and witnessing some incredible, and incredibly funny, things. 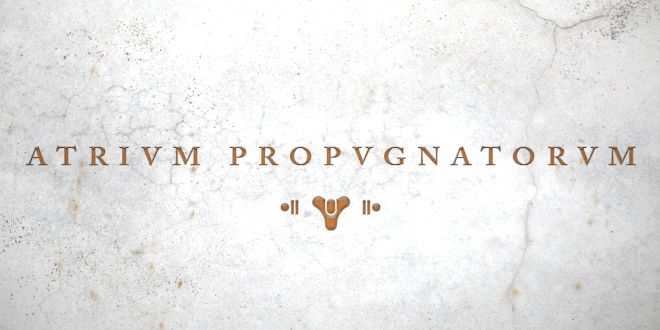 Starting out, we’ve got a YouTube video of a player who turns an entire Crucible match around in a flurry of kills. I’m not much of a Crucible spectator, but even I couldn’t get enough of this guy’s moves. And to close, if you haven’t seen this video about the worst day a Dreg ever had, you owe it to yourself. Even I can sympathize with the cruel twisted humor of it all. If you’ve got something stranger than fiction that’s happened in the Destiny-sphere, we want to hear about it! And now with House of Wolves just around the corner we want to know if you’ve braved storms and free taco plates to grind out those last Strange Coins so you could stock up on Exotic Shards. Or are you an international player who has read those Japanese crates on the moon and actually understood what they say? Sound off in the comments and tell us all about it. There’s nothing more interesting than seeing how our everyday lives are, in reality, stranger than fiction. And who knows, you just might see your story as the next headline!